Originally built in the 1820’s as The Station Hotel, it was renamed as The Haughton Arms Hotel in 1871 and was the first major building in the area, stimulating the growth of Alford. Built immediately after the Thomas Telford bridge, it still dominates the centre of the village, but is now set within a broad street of shops and large houses. Since then the Hotel has grown and developed into its’ current format under its present owners, gaining a well-earned reputation for good food and great service. 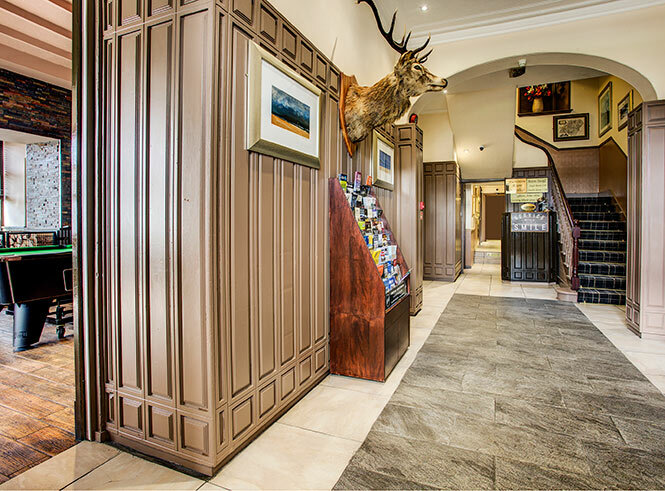 The Haughton Arms Hotel offers 10 quality bedrooms finished to a very high standard and has a excellent conference / banquet suite alongside the hotel’s renowned restaurant. The Alford Valley Railway, Grampian Transport Museum, Alford Heritage Centre and Craigievar Castle are popular visitor attractions, with a range of other archaeological sites, stone circles, and castles (including Balfluig Castle, Castle Fraser and Drum Castle) being within easy reach by road. Situated in Alford, Haughton Country Park is a large and popular green space with woodland walks. The 18 hole Alford Golf Club is an attractive and pleasant course which has a large local membership. In addition, there are many opportunities for the fishing, shooting and country pursuits within a short drive from the hotel. Ask us if you want some recommendations. At the Haughton Arms Hotel we understand what a huge undertaking it is to find the perfect venue for your wedding celebrations. Over the years we have built up a reputation for superb food, all cooked with passion and experience, giving you a dining experience par excellence to tempt and tease your tastebuds.